If your lawn’s spring rebirth is less than glorious thanks to weeds, dead spots and lackluster color, now is the time to shape it up. 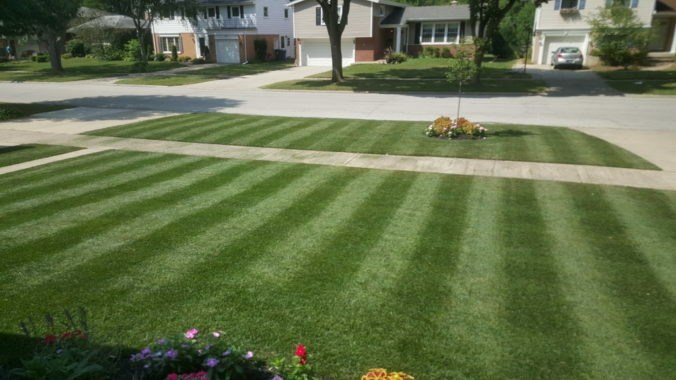 During your lawn’s spring growth spurt, it responds quickly to your improvement efforts. But don’t wait: You have about six weeks until grass growth slows way down when summer turns hot and dry. That’s true whether you live in the northern US and have a cool-season grass like Kentucky blue or fescue, or live in the Deep South and grow a warm-season grass like Bermuda or St. Augustine. Applying half the yearly fertilizer amount now gives your lawn a quick boost at a critical time (apply the other half in early autumn). Use an organic lawn fertilizer—organics are so widely sold now that there’s no excuse to use a synthetic one. To take feeding to the next level, apply a micronutrient treatment. Liquid seaweed contains a host of trace minerals (warning: it’s stinky). Or for a deep green lawn that will make your neighbors green with envy, try an iron supplement. The safest option is to dig or pull up weeds. Even if you don’t get the whole root, you’ve weakened the weed and kept it from producing seeds. If pulling isn’t enough firepower for your weed problem, spot treat existing weeds with a weed killer spray, which is safer than dousing the whole lawn. Look for an organic week killer that contains concentrated iron—the ingredients will list either iron HEDTA or FeHEDTA. The iron controls or suppresses broadleaved weeds such as dandelion, white clover and plantain, but doesn’t kill the grass. Brand names as of this writing include Ortho Elementals Lawn Weed Killer, Whitney Farms Lawn Weed Killer, Natria Lawn Weed Control and Fiesta Turf Weed Killer. To control broadleaf weeds before the seeds sprout—and to feed your lawn—apply corn gluten meal. Garden centers carry corn gluten meal labeled for weed control, in both dry and liquid forms. Corn gluten meal keeps the seeds of crabgrass, dandelions and some other weeds from growing. The trick is to apply it before seeds start to sprout. In spring, that’s usually around the time the crocus and forsythia start blooming. All sorts of mishaps can kill spots in the lawn—spilled fertilizer, dog urine, insect damage. Patch small areas with sod cut from an inconspicuous part of the yard. Reseed larger areas and keep the soil surface moist until the grass fills in—deep watering isn’t needed, you just need to keep the grass seeds from drying out. Depending on the temperature and wind, you might have to spray water on the area twice a day at first. Fight it. Loosen compacted soil to about 6 inches and reseed. Then train people to take the sidewalk and learn how to use your car’s side mirrors. Don’t fight it. Make a path of bark chips or stepping stones where everyone walks. Replace the grass strip adjacent the driveway with a wide band of bricks or pavers, or cover it with bark mulch. Grass grows fast in spring; even faster if you fertilize it. Don’t try to get away with a once-a-week scalping. Cutting off more than about 1/3 of the lawn’s height forces the grass to deplete the food stored in its roots to replace its lopped top. And depleted roots lead to a weaker lawn that’s ill-equipped to cope with heat and dryness. If you’re truly committed to a better lawn, be prepared to mow twice a week in spring. You do not live in a fertilizer ad. You do not have servants. No one has found a way to add hours to the day. Until you remedy any of these situations, you’re never going to have a lawn that is utterly and eternally perfect. But with this six-week program, you’ll have a greener, healthier lawn.